Join us for the finale of Elevate the Arts with the House of David Gang, who have been called “Canada’s #1 Roots Reggae Orchestra”! Joining them are popular beat queens Sista Sully and Pleena. 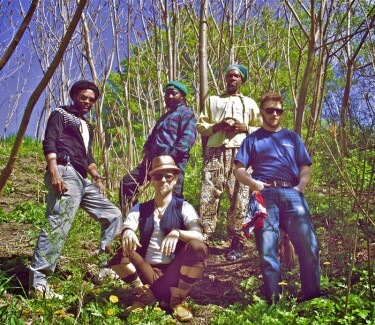 Throughout their career, House of David Gang has been known for their uplifting roots rock reggae sound, which pays homage to the classic 70′s & 80′s Jamaican sound mixed with a modern rootsy Canadian feel. The band takes its name from The House of David, an afterhours spot on Queen Street West in Toronto that was a Rasta hotspot for reasoning, dancing and reggae music from the late 80s until the mid 90s. After a brief hiatus the band re-energized in 2004 with a revamped line-up, touring relentlessly in clubs & festivals, building a strong grassroots following across Canada. After collaborations with over 20 musicians from Canada’s reggae community, and with the wisdom of 20 years of songwriting, performing and recording, House of David Gang recently emerged from bass player/producer Snappy Homefry’s Playhouse Studio, releasing their finest album to date “Reggae Warrior” on NuFunk.ca Records. Elevate the Arts (ETA) is a grass roots multi-disciplinary cultural event held in the heart of Courtenay, BC. It’s all about using arts and culture as a vehicle for re-imagining our communities and the planet. ETA are committed to evocative, edgy, experimental and thought provoking content that encourages us to examine, explore, enjoy and elevate the world around us. With Sista Sully… a selectress with eclectic collections …bringing you roots dub reggae and soul for a loving vibe on the dancefloor. and followed with Pleena… is a whirl wind of world music. From Europe to South America back to Africa, she brings the best from every continent and smoothly orchestrates a storyline that Gaudi once described as ‘intelligent progression’. Having recently given up a 6-month residency at The Flying Canoe in Courtenay BC, Pleena is dedicating her efforts preparing for select, seasonal shows at the Waverley Hotel with The Electrolyte Collective. Next one is a Solstice Celebration on June 21st with the theme of ‘Midsummer Night’s Dream’ (get the sparkles out for this one).